Top sheet could be longer.... but they're nice. These sheets are substantial, yet soft against the skin. I've no doubt these will last for quite a while. As for fit, anyone with a California King sized bed knows this particular frustration -- that most of the time, when you buy sheets, you'll get a bottom fitted sheet and pillowcases that are the right size, but the top sheet would be better sized for an Eastern King. It's a little too wide, and a few inches shorter than it should be. And that is the case with the top sheet here; it would be absolutely perfect if it was 4 inches longer and 4 inches less wide. That said, they're very nice, and we're pleased with them. Pros: Thick yet doesn't make you hot Feels durable Soft Fitted sheet fits snug and stays on well Cons Top sheet is too short. im a 6ft guy on a full size bed and to have the sheet tucked in 1 inch only allows it to come up to my mid chest. 6-12 inches longer would be great. That being said, not able to tuck in on a 12 thick mattress Edit: I measured the flat sheet and it is 84 wide X 86 long. Not the 86 wide by 96 long advertised. Other Thoughts Never had a problem with wrinkles like other people are saying. 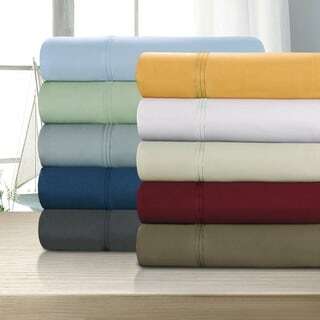 Pulling directly from dryer and laying on bed will give you no wrinkles Leaving set in dryer all day will give some wrinkles but after sleeping on them it for 1 night they are all gone front fitted and top sheets. End of life edit: After 2.5 years in my weekly rotation of bed sheet sets, the fabric is falling apart in many places. Not long after they finally turned to full holes. The other bed sheets i have had for a longer time still look like new compared to this set. Plus they were half the price. Needless to say, I will not be buying these again. Overstock has done it again..... These sheets are not for the feign of heart. They are not your silky, satiny, impress your boyfriend or girlfriend with the feel of soft (cheap) sheets. These sheets are built for sleeping - in comfort. Yes, when you wash them they wrinkle..... but if you press them they can be made as straight as a level..... They are cool, crisp, smell like springtime freshness, sleep like a baby sheets that are cool to the touch and look like a million dollars on the bed. Don't write me about too scratchy or too stiff... When I'm in bed I like mine stiff. The fact is these are the finest quality sheets that you will ever find for the money - and I have tried virtually all of them. These things wear like iron, last for years, and will be as good for sleeping five years from now as anything in your linen closet. There... I've said it - and I've said all I have to say about this product. Not any where near what I expected. These sheets are nice but not the quality I expected. I have had 800 count Egyptian Cotton sheets that are so much more comfortable and luxurious than these sheets. I was disappointed as I expected something a step up from what I had but these seemed very average. Color was exactly what I expected. However, the description says these sheets will fit mattresses 18 inches deep but they did not fit my 14 inch mattress. Loved the sheets at first; thick and heavy and very comfortable. I hate limp sheets that wrinkle and bunch every time you move in bed. Line-dried them for the first six months and when the weather got too cool to hang outside I used the dryer. I have an 8-inch mattress and 5-inch featherbed. The fitted sheet is supposed to be up to 18 inches deep but now doesn't tuck under the mattress. The top sheet overhangs the bed by only a few inches. Like sleeping under a postage stamp. No sympathy from Overstock. They offered a partial credit if I pay to ship them back. Phooey. Will just use this queen set on a full-size bed and hope they don't shrink any more. If you want to try these sheets, buy a size larger and if you want something for a king bed buy something else! These sheets fit our California King mattress perfectly. We have a 4 inch topper on our mattress and these sheets fit very well. These sheets have not gotten soft like other sheets that I have bought. We are very pleased with these sheets and would recommend them to others. I love these sheets. They are great to sleep on and the fitted sheet accommodates my pillow top mattress with my 3 inch foam mattress on top. I've finally found the sheets that feel substantial yet soft, but not "silky". I love them! Plus they have the deep pockets that fit my mattress. Even the pillowcases are a few inches longer than most so my fluffy down pillows aren't always sticking out. The Best Sheets I've ever had! This Egyptian Cotton 1200 thread count is definitely the best sheets that is out there. A lot of people prefer the sateen sheets which slides and is very slippery. Before upgrading to the Kingsdown King Size bed, we had a queen size and were using a high quality (900tc) and it was very comfortable, but this 1200 tc is by far the most comfortable I've had. I'm very happy with my purchase and will be purchasing the other different colors. F.Y.I. There is a 1000tc that is available by other manufactures that is listed on overstock, but it isn't as half as good as the Egyptian Cotton 1200tc. I know because I made a mistake in purchasing the 1000tc. These sheets are amazing. They are thick, nice cotton with a pretty sheen and they feel great. I have laundered the 2x and they feel and look even better. Want HEAVY Sheets? Buy these. 1200 thread means more cotton per square inch. When you add up the all square inches of my queensized sheet, you are talking a HEAVY sheet. In the summer, this might be all you need as a cover at night. As other reviewers noted, a bit scratchy and stiff on the first few uses--repeated washing/dryer will soften them up. The only down side I've noticed so far is a tendency for the sewn hem to roll up on itself. I have a mangle iron, so I could easily get rid of this if I wanted to, but it would be a pain to flatten with a regular iron. If you are looking for the silky, satiny sheets, look elsewhere. If, on the other hand, sturdy and substantial is your goal, pull out your credit card. These are the thickest sheets I've ever seen and I love them! I got the navy color and it is exactly what I have been looking for. The sheets fit my king mattress (about 18 inches thick) very well. Not too tight to get on and not so loose that they wrinkle in the middle while sleeping. I'm very happy with my purchase. These are NOT flimsy sheets!! These are very thick and comfortable sheets. They are usually very wrinkled out of the dryer but they stretch out just fine on the bed for me. Please do not think that these are the sateen sheets. These are the heavy weights if that is what you are looking for. I bought my first set for the queen bed about 8 years ago and they are still going strong. These king size are perfect and fit our 14 inch mattress with room to spare. I've been buying 1000 thread count sheets from Overstock for at least 10 years. I decided to spend a little more for these 1200 thread count sheets. They are substantial and soft, and the king flat sheet is a few inches longer than other high thread count sheets, so it stays tucked in better. I wash and hang dry my sheets, so I can't speak to whether or not they shrink. I will definitely buy again. These are a really high quality set of sheets and I couldn't be happier with my purchase. Being 100% cotton they do tend to come out of the dryer a bit wrinkled, but nothing a quick ironing couldn't fix and well worth the comfort of 100% cotton. They are nice and thick and very well made. They fit great on our 14-inch king mattress. Best sheets you will ever own. While the tread count is 1200, the sheets are still very soft and flexible and not too thick, Wish they had a deeper pocket, since when I bought a new mattress, they no longer fit (15-inch deep mattress). If they come out with a deeper pocket, I will buy again. I was a little worried about ordering sheets on-line. It seems that there is some debate in the industry about how thread count is determined. I've read several reviews of other products in which customers complain that the high thread count sheet that they ordered was perhaps, misrepresented. Having said that...these sheets are fabulous. They're a little stiff coming out of the package (as you should expect with 1200 tc) but they soften up with a few washings. The fitted sheet fits the bed nicely with a 14-15 inch mattress. It has elastic around the whole sheet. Flat sheet seems a little wider and a little longer than my previous sheet set. That's nice too. All in all a very good product with a good value.